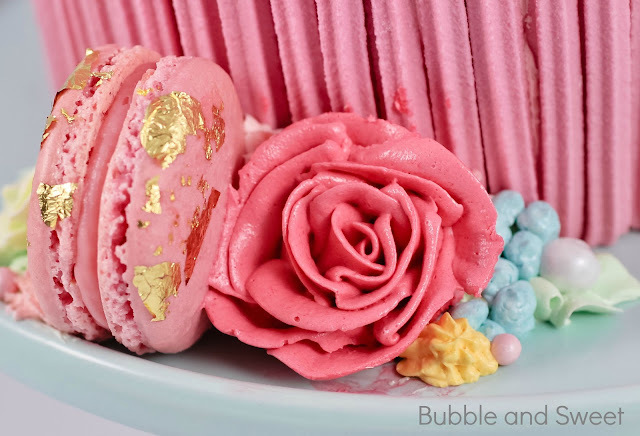 Sweet had her 9th birthday and I made this 'My Sweet Candy Girl' birthday cake with gold leaf decorated macarons, hand piped butter cream flowers and musk stick lollies. In the past we have had quite fancy parties for her and some pretty spectacular cakes, and when I say for her, I really mean for me. Because it seems to make Sweet happy what she really wants is lots of lollies and candy on a cake. I know this because a few years back I made quite an elaborate cake that I managed to make look like it was set in a mirror on the wall. It was a carved unicorn head and it took quite a bit of work (CLICK HERE for a free video tutorial on making that unicorn cake). I was quite pleased with myself of course and Sweet did love her party and still talks about it now. However a few months after that party a girl at school brought in a cake covered with lollies (that's Australian for candy), Sweet told the family at the dinner table in detail how amazing it was. Pretty much because.......lollies. That's right she is a kid, all it takes to impress her is quite a bit of candy. 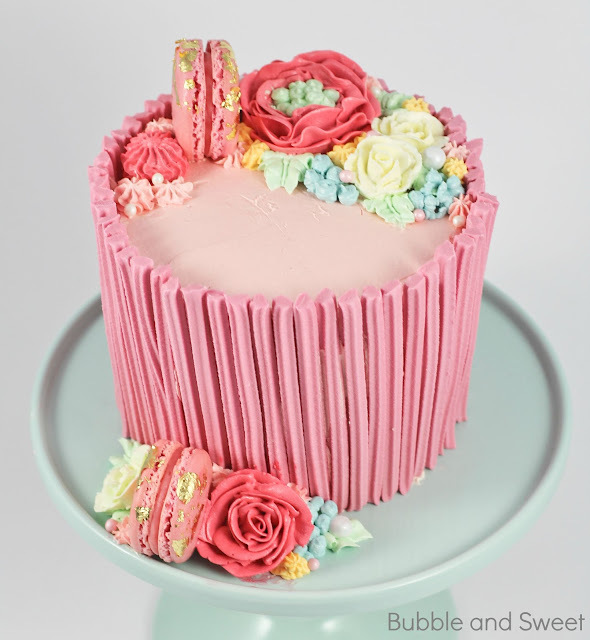 So this year I decided to stick lots of lollies on the cake, we did compromise with some pretty piped flowers but as they were buttercream and therefore creamy sugar Sweet was totally ok with it. Maybe the best part of all was that Sweet and my son The Destroyer got to join in decorating the cake and put the musk sticks around the edge of the cake. I think if at this stage I had given Sweet a stack of extra lollies/candy and told her to pour it into the top all the kids would have been happy, but I decided to pipe on some flowers and swirls, pop on a few macarons and then add sixlets and soft sugar pearls. 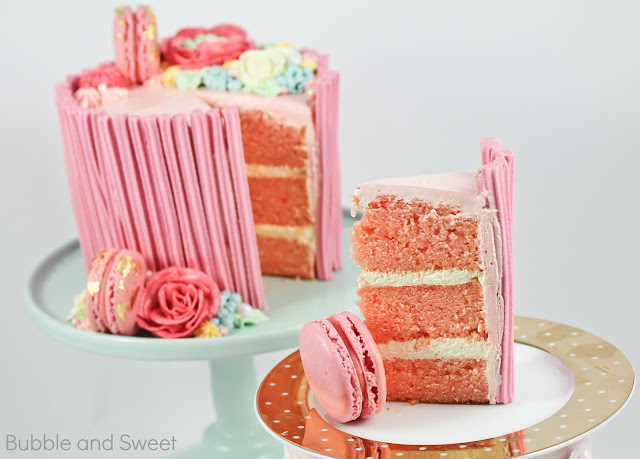 It ended up being a perfect mix of sweet and pretty, although I did only eat one musk stick despite having quite a few on my slice. 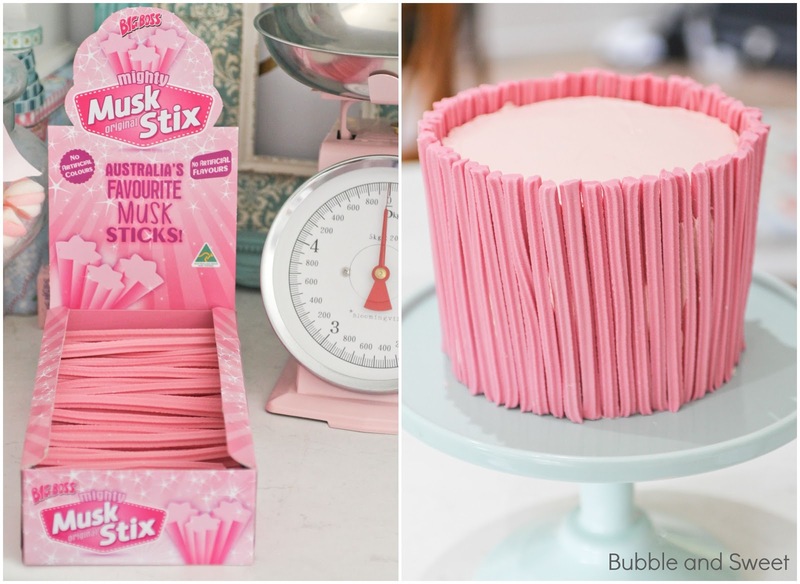 If you can't locate musk sticks you might like to substitute pink chocolate covered pretzels or strawberry pocky sticks. Later in the week I will be popping up the recipe for the strawberry layer cake which has been a favourite in our household for many years. Linda Vandermeer is a blogger, baker, maker and author of the Children's cookbook Sweets on a Stick: More Than 150 Kid-Friendly Recipes for Cakes, Candies, Cookies, and Pies on the Go! Published in the USA in 2011 the book is still available at Amazon and many online bookstores. 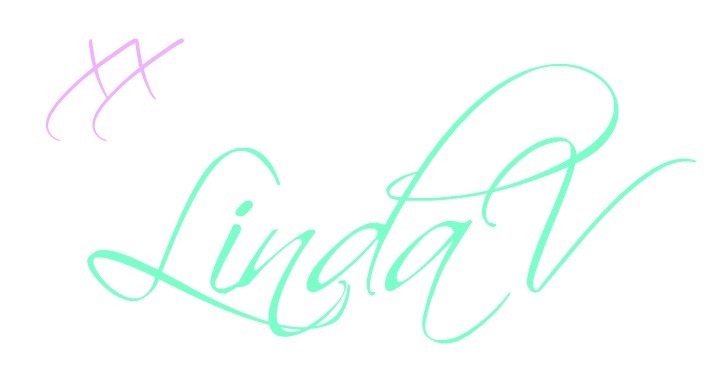 Affiliate links may earn me money and contribute to supporting this blog. 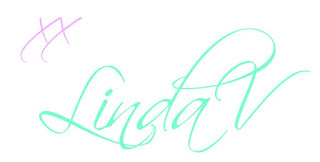 Original ideas, photography and recipes Linda Vandermeer please do not reuse without permission. When I saw these plates online I was smitten. Look at them. 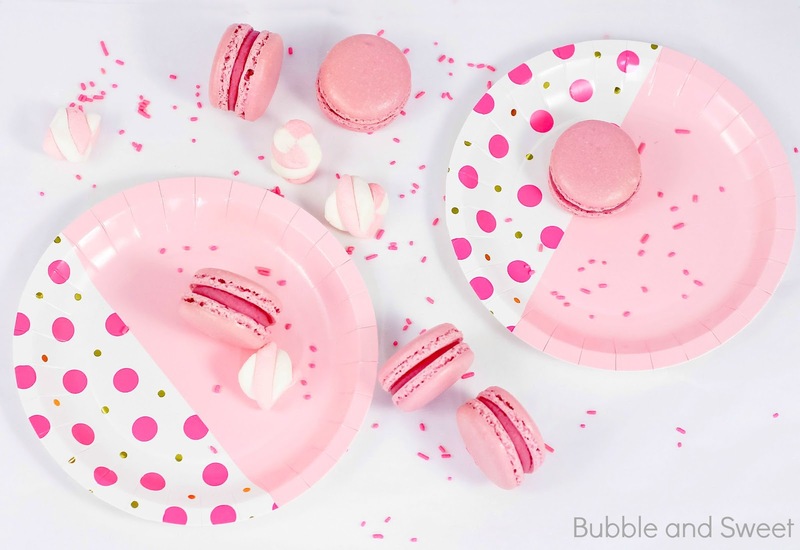 Just look they are pretty much the cutest disposable plates I have ever seen. I don't even like disposable plates, I completely avoid them where ever possible but I had to buy these ones I mean seriously they have pink polkadots and gold spots and then part of them is the sweetest pale pink and no this post is not sponsored by the company. Anyhoo then I made some macarons to serve on them 'cause they deserved something special. I picked mine up from Lark Australia. 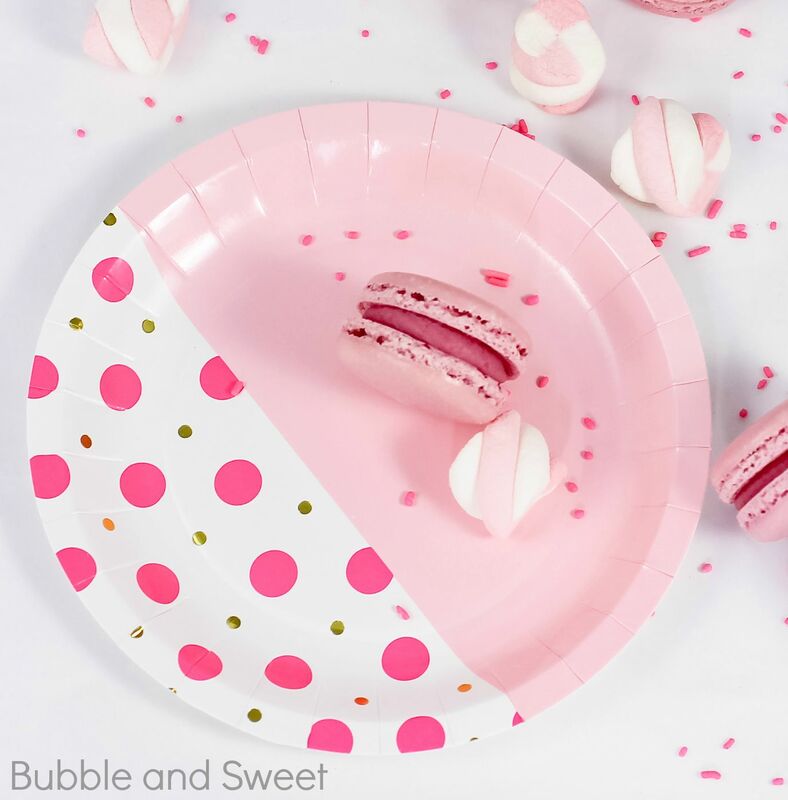 In the US check out Bash Party Goods who produce the plates. I did read on Bash Party Goods Instagram page that they had macarons in mind when they created these plates so just to help you out I'll re-share my recipe. Macaron Shells makes around 40 shells or 20 filled macarons. 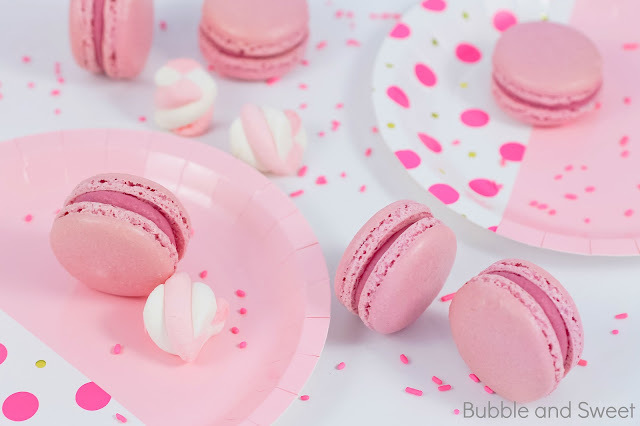 See below macaron recipe for simple instructions for ganache filling. *ageing egg whites refers to separating the yolks from whites and then leaving the whites to age for a few days. This can be done on the counter if your countries climate permits or in the fridge, wrap the bowl with plastic wrap and then pop a few holes in the top. Alternately you can pop fresh egg whites in the microwave on high for 10 seconds or so - I used the microwave method in this batch pictured. 3. 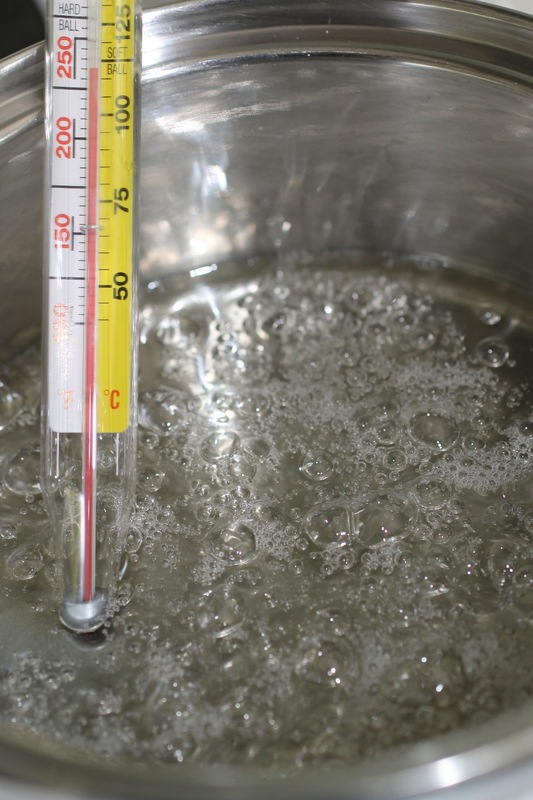 Pop granulated sugar and water into saucepan stir to combine and cook without stirring to 118C (245 F). Brush down the sides with a pastry brush dipped in water as required to avoid the sugar crystallizing. Once the mixture reaches 115C (240 F) start mixing the egg whites on high. Make sure you have a pouring shield on your mixer, when the sugar syrup reaches 118C (245 F)remove from heat and immediately pour in a thin stream down the side of the mixer bowl continuing to whisk on high. 5. Add meringue mixture to almond mixture and using a large spatula fold the mixture together until it starts to shine and forms. If you run the spatula through the mixture it should form a ribbon that disappears back into the mixture after about 20 seconds. 6. Add the mixture to a piping bag fitted with a plain tip (or just cut the end of a disposable piping bag, that's what I do) and pipe in lines onto parchment lined baking sheets. To make the macarons as even as possible I apply a constant slow pressure to the piping bag and count a few numbers like up to 3 for each one. 7. 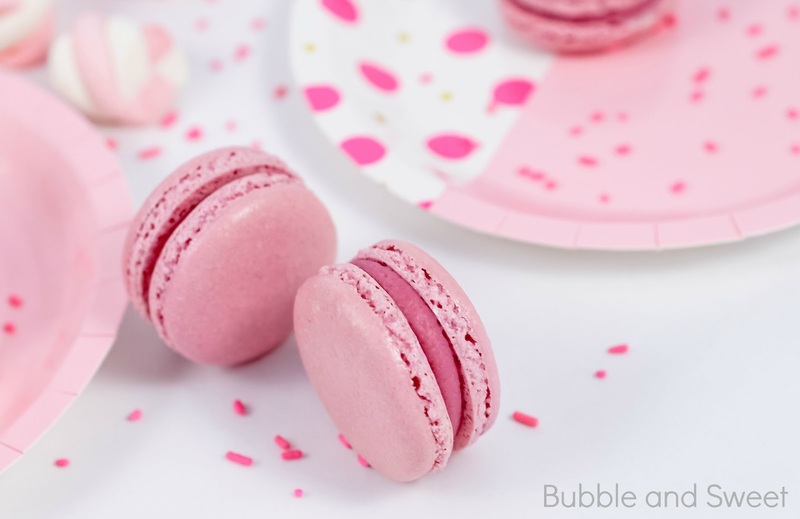 Set aside for about 30 minutes or until the macarons have formed a skin so that the macaron mixture does not stick to your finger when gently touched. If the weather is humid this step may take longer up to 2 hours. I pop on the aircon if it's humid at my house. 8. Meanwhile preheat oven to 140C (285 F). Once ready bake the macaroons for around 13 to 16 minutes depending on size, it may take longer, all ovens are different. If they are baked and you gently push on the side the tops will not move, if the tops do move bake for another minute or 2. Also they should not be browned if they are reduce the heat for the next batch or bake for less time. 9. 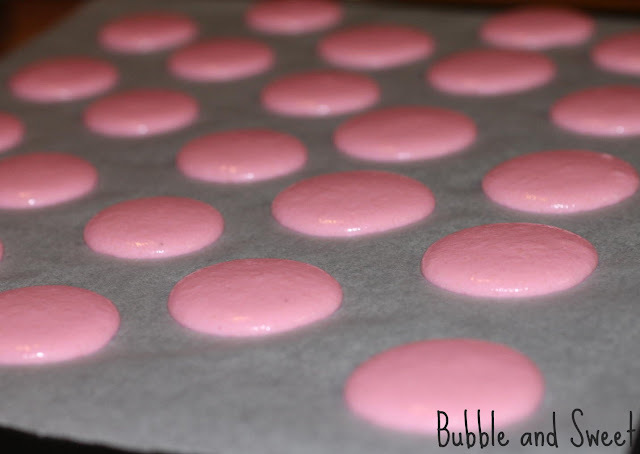 Once baked remove the baking trays and immediately slide off the macarons and the parchment onto the work surface and let cool completely before removing the shells. 10. Once cooled match disks into like sizes and sandwich together using the ganache. To make ganache melt white chocolate with cream in the microwave and mix gently until combined, use a ration of 3:1, so for example 300 grams (10 1/2 oz) white chocolate to 100 grams (3 1/2 oz) cream, sorry guys I measure as I already have the scales out and I can't be bothered messing up a liquid measuring jug :) Add some gel color and raspberry oil/flavor to taste. I love it when I have left over macarons and get to have a play around. 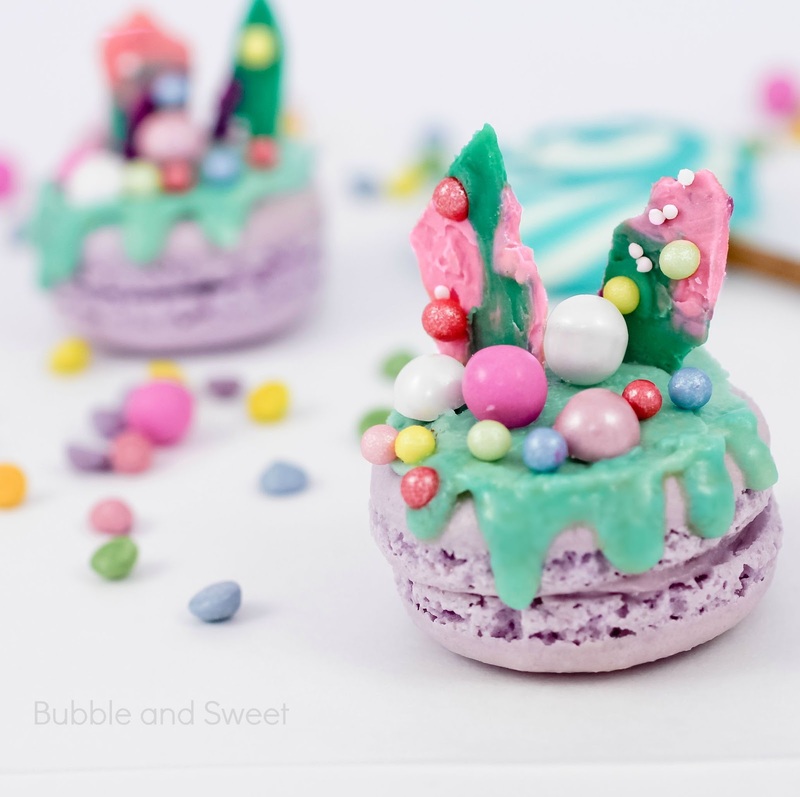 I had half a dozen of these pretty purple mac's sitting around plus a bit of the teal ganache and we always have sprinkles and candy sitting around so I whipped up these cute Candylicious macarons. They might be my new favourite macaron, well to look at anyway. 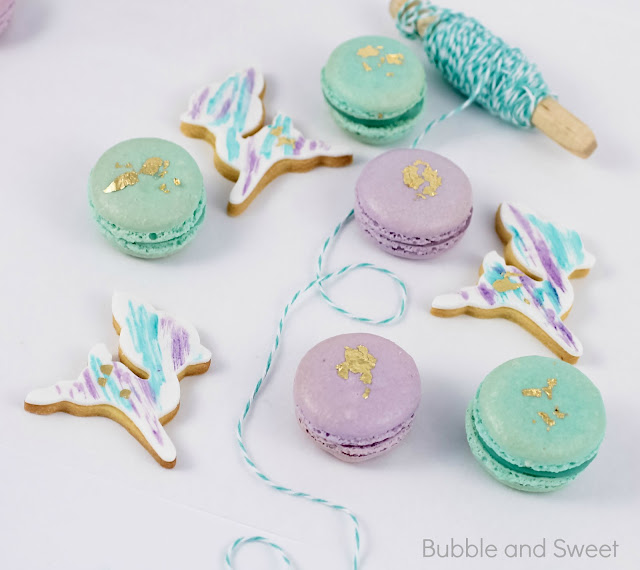 They look so pretty and party ready and of course they are a little bit inspired by Katherine Sabbath's beautiful cakes. 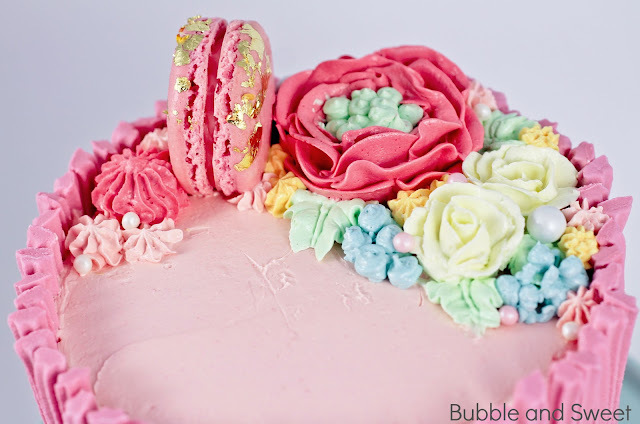 Mostly you just melt the ganache and spread it onto the top and gently push it over the edge so it dribbles down then press a few pastel pearls and sixlets onto the top. I added some mini shards of pastel chocolate as well. Do you have a favorite cutter? One that when you pull it out you know that the cookies you make will be super adorable no matter what you do. 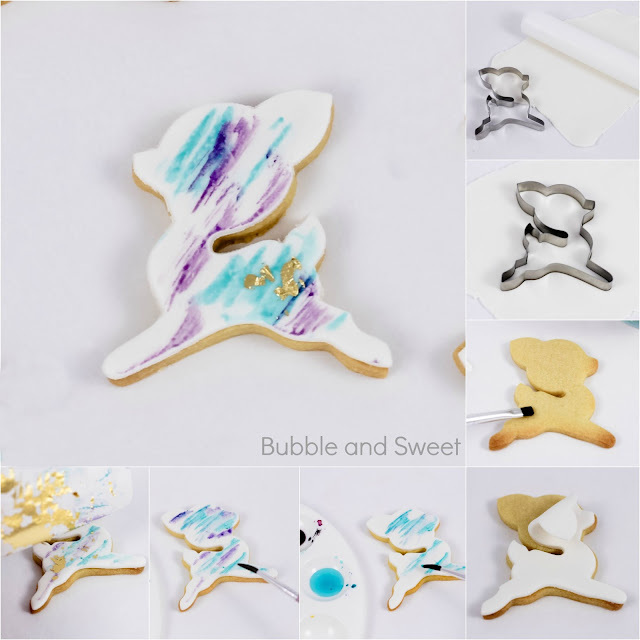 This Deer Aimee cutter from Cakes by Bien is one of my go to cutters it's just about as cute as you get, so when my friend asked me about it for her daughter's first birthday party I was a bit excited. 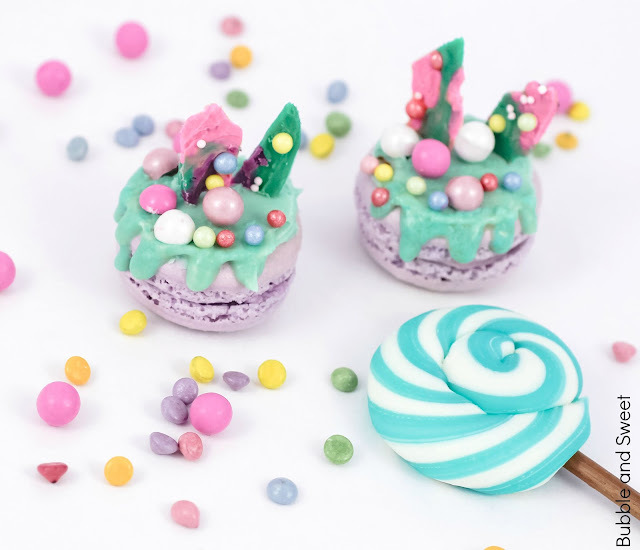 Anyhoo the whimsical theme was based on the birthday girls super sweet bedroom colours so I came up with a set of cookies and macarons to tie in with it. 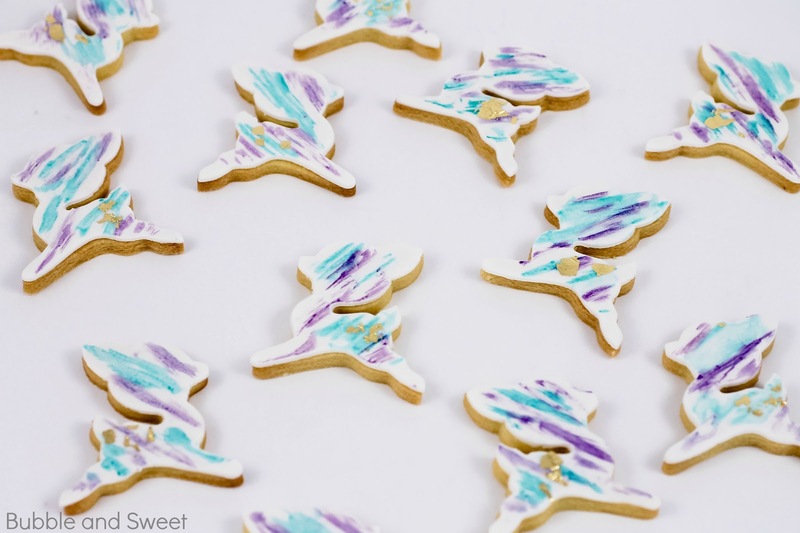 These 'A Touch of Whimsy' water colour cookies were some of the filler cookies. You know easy to make cookies that match in with the more complicated design but still look great. But I think you can tell from the first photo they are impressive enough to have all on their own. 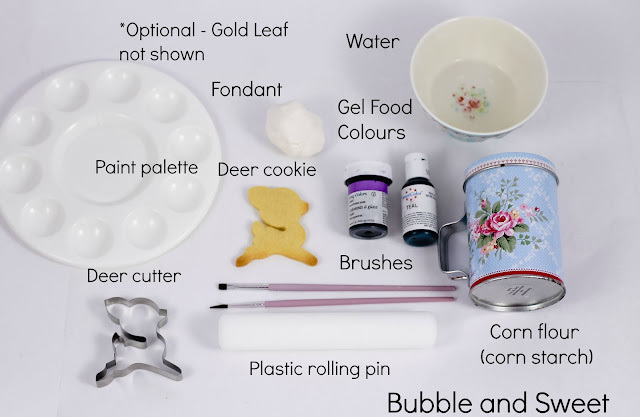 And the fabulous thing about the technique in this tutorial is that you can apply it to pretty much any cookie shape with any colour theme and it will look just as pretty. 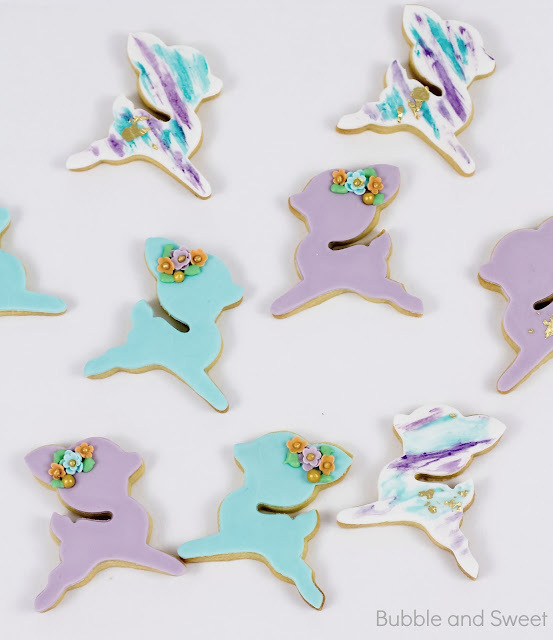 I'm hoping to pop up a video tutorial of me making these cookies on my you tube channel soon, plus I will definitely have tutorials for the other A Touch of Whimsy cookies soon. 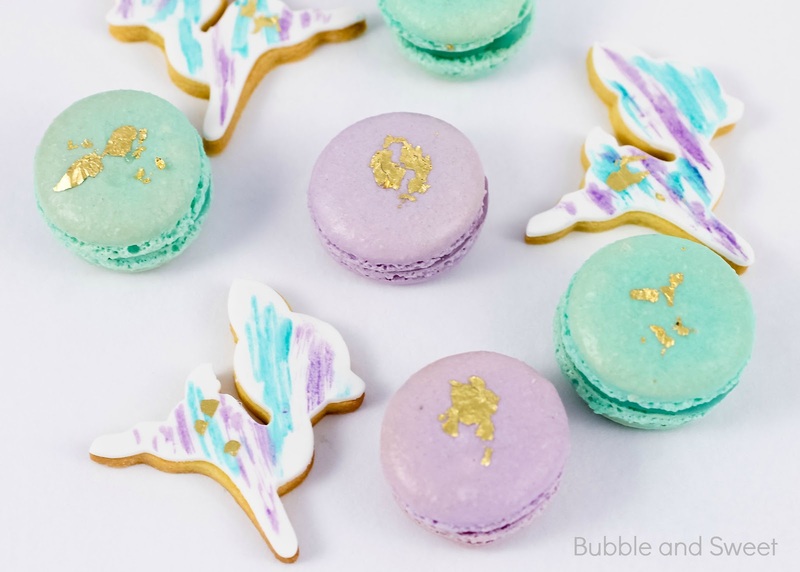 I've added edible gold leaf to the cookies but if you don't have it just leave it off and they will still be super cute. Using the cookie dough recipe roll make deer shaped cookies. The dough will make around 60 small cookies. Bake as per instructions until golden. Knead the fondant until pliable. Dust the workbench with cornflour (corn starch) and using the small rolling pin roll out the fondant until quite thin. Use the deer cutter to cut out a fondant shape. Lightly brush the cookie with water and place the fondant onto the cookie. Gently press the fondant down onto the cookie using the rolling pin to smooth into place. Take a small amount of teal food colour with the edge of a toothpick. Place some water into a spoon or paint palate and use a paint brush to mix with the water. The colour should be a bit washed out. Dry the brush a little on a piece of paper towel and then lightly brush the side of the paint brush along the fondant covered cookie. If the colour becomes too weak mix in a little more gel food colour. Repeat the same with the violet. If you find the violet is too dark you may like to add a little rose or pink to the mix to brighten it a little. Allow the food colour to dry. Brush a little extra water onto the back of the cookie and adhere a small amount of gold leaf to the fondant covered cookie. Allow to dry and store in airtight container for up to 5 days. Cream butter and sugar in a large bowl using an electric mixer until light and fluffy. 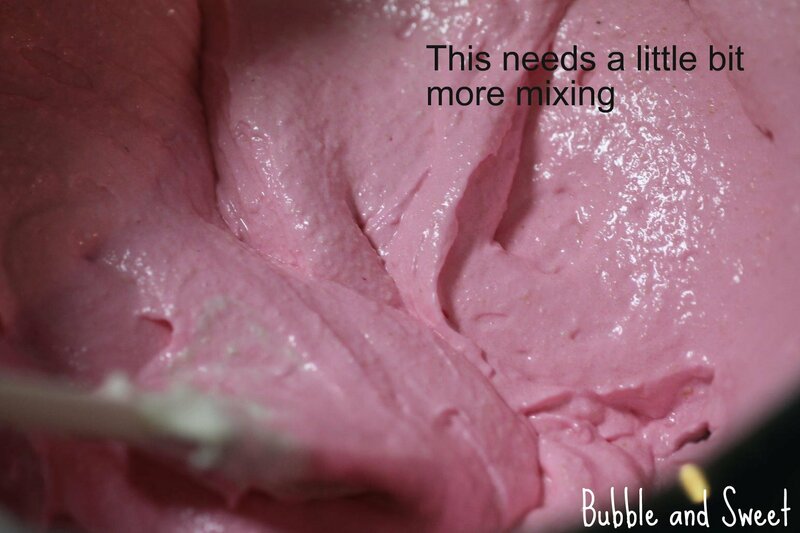 Reduce the speed to medium low, add the egg and vanilla and mix until combined. Reduce mixer speed to low and mix in the sifted flour mixture until combined. Wrap the dough in plastic and chill in fridge for 30 minutes or so. Line a few baking trays with parchment/ baking paper. Dust workbench with plain flour and using a large rolling pin roll out the dough until around 1/2 cm (1/4") in thickness. If the dough is to hard you may need to work/knead it a bit until you can roll it out. Pop the cut cookie dough trays into the fridge to chill again for around 30 minutes until firm (or in the freezer for 10 minutes). Preheat oven to 160 C (320 F) and cook the cookies until they just start to turn golden, around 15 minutes (less or more depending on cookie size). Cool on trays for 5 minutes and then carefully lift onto a wire rack to cool completely prior to decorating. - Cookies can be stored in an airtight container for 1 week.